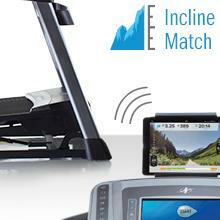 NordicTrack machines powered by iFit provide the most high-tech personal training experience available. With iFit, you can plan Google Maps routes anywhere in the world, receive daily workouts designed by certified personal trainers just for you, record your long-term progress, and much more! Run through Paris or hike the Grand Canyon. All you have to do is draw a Google Maps route and iFit will display the Street View image on your 10 inch, full-color touchscreen. The touchscreen is Web-enabled so you can also visit your favorite websites while you work out. 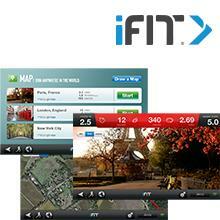 When you choose a Google Maps route, iFit will automatically adjust your incline to simulate the natural terrain. With a 3.5 continuous horsepower DurX Commercial motor, the C 1650 treadmill has the energy to take your workout to 12-percent incline so you can target specific muscles and burn more calories. 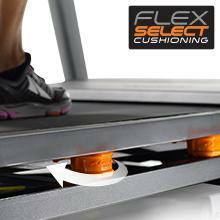 When you run on the C 1650 treadmill’s 20-by-60-inch tread belt you can choose between a FlexSelect-cushioned deck that helps reduce impact on your joints, or a firm deck that feels more like running on the road for those Google Maps routes on iFit. Make adjustments with the simple turn of a knob. This tablet holder adjusts to your preferred viewing angle so you can enjoy your favorite movies, music, and shows while you work out. It’s fixed above the console so it doesn’t block your touchscreen. The SpaceSaver feature allows you to fold your machine up after use for more convenient transportation, cleaning, and storage. A telescoping EasyLift shock does most of the lifting for you. Get professional training when you select one of the 34 preloaded workouts. Each program was designed by a certified personal trainer to meet your speed, incline, and heart rate goals. The AutoBreeze fan is the most powerful fan used in NordicTrack equipment. 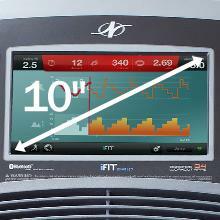 With on-console controls you can choose your own fan speed or let it adapt to your workout intensity. 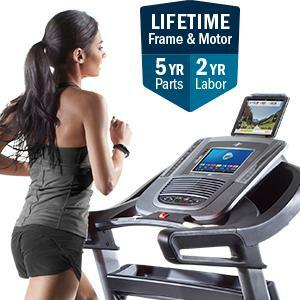 The C 1650 Treadmill comes guaranteed with a lifetime frame and motor warranty, a 5-year parts warranty, and a 2-year labor warranty.